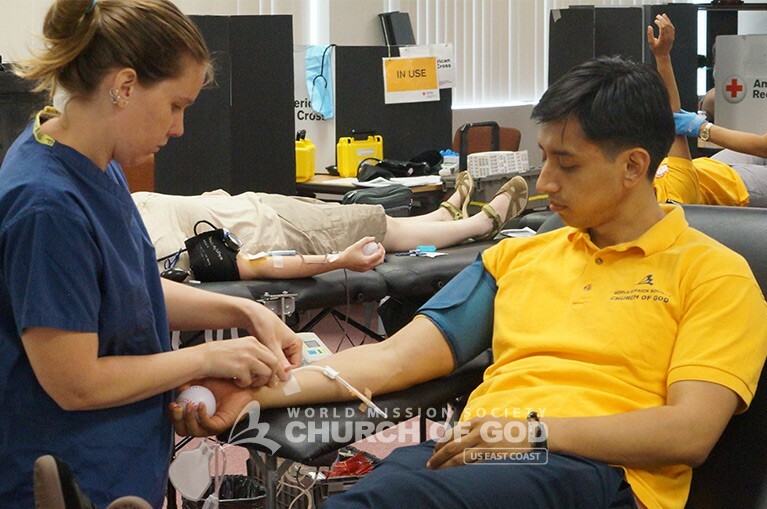 The World Mission Society Church of God held its third annual East Coast Mega Blood Drive. And the Churches of God in New England centered on Boston to take part. 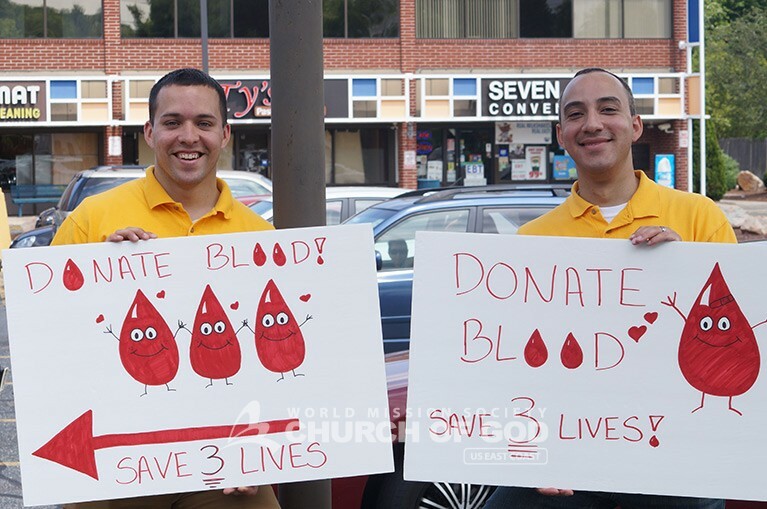 The blood drive took place in 13 different locations throughout the East Coast and the Caribbean on the same day. At the Boston blood drive, the American Red Cross collected more than 100 units of blood. Eager donors ranged from young adults to the elderly. All of the local church members united with the community with the goal to save as many lives as possible through blood donation. Though some first-time donors were initially nervous about donating blood, they overcame their anxieties. The positive environment and large numbers of fellow donors gave them the motivation to donate. The encouraging bright smiles of the volunteers helped them to reaffirm the purpose of why they came out. A single donation can save up to three lives! Blood donation is needed throughout the year. But, in the summer months, the need is even greater due to blood supply shortages. This is the reason the Church of God holds its annual Mega Blood Drive in the summer time. The church members facilitated the registration process, welcomed, escorted donors from the donation beds and assisted in any way they could. Afterward, they even donated blood themselves. “It is a great honor to see the courage of the donors that regardless of their tiredness and busy life, they still made time to come and donate blood today,” said Medical Assistant Jessica Sanchez. 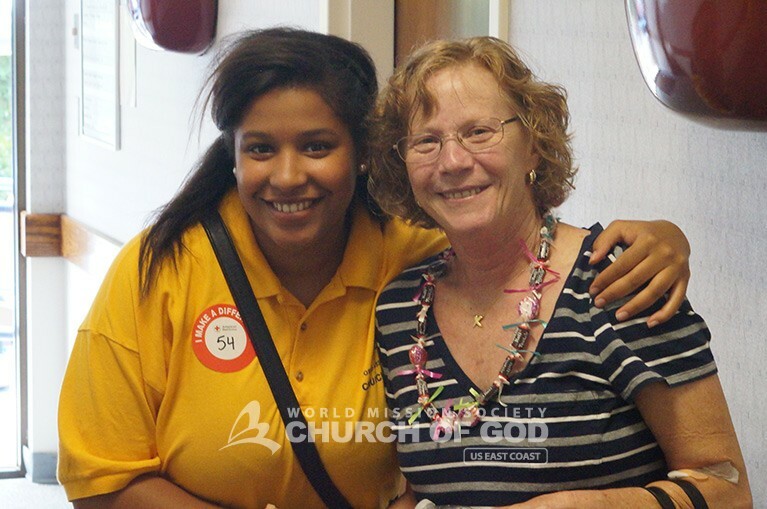 The Church of God is thankful to all who participated in the blood drive in Boston. Volunteers will continue serving their community with a loving heart following the example of Christ. Congrats on the successful blood drive in Boston! I had the chance to attend the same blood drive in another location. To be honest, I was always afraid to give blood… but when I’m alongside other volunteers, the environment is encouraging so it’s easy to overcome the anxiety and to remember the cause of saving lives. Wow, Church of God is truly amazing. They are the only church that have true love for humanity. Church of God is always eager and willing to take the initiative in doing hard work. What a perfect example for all other organizations to follow. Thank you so much Church of God for all your hard work, you truly have the true love of God in you. 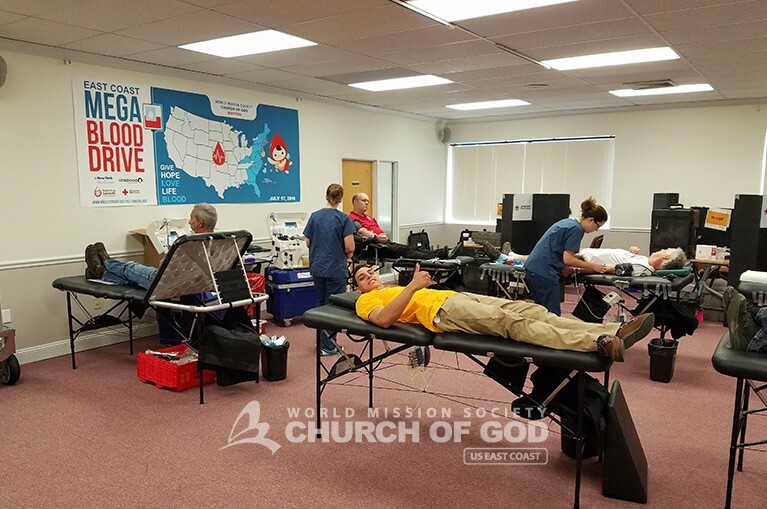 Not many people can say that they took part in saving someone’s life, but the members of the WMS Church of God have helped save thousands of lives through countless blood drives. I am thankful to be part of this church and surrounded by so many selfless members who also participated in many blood drives. It is very encouraging to see how the members from the Church of God, came together through this Blood Drive Event. This shows their commitment to help the community. I am very proud to be part of this amazing Church, that displays the love of God through their deeds. This was my first time giving blood. So I was very nervous, but when I looked around everyone that was giving blood, or had already given blood looked so happy. This gave me great courage and I too was happy and glad to donate. I am looking forward to donating again with the Church of God in the near future. I don’t think my first time experience could have been so joyful without the Church of God members. Wow such an amazing blood drive. Before the Church of God I never gave blood. But I’m so thankful to save a life and to give blood. 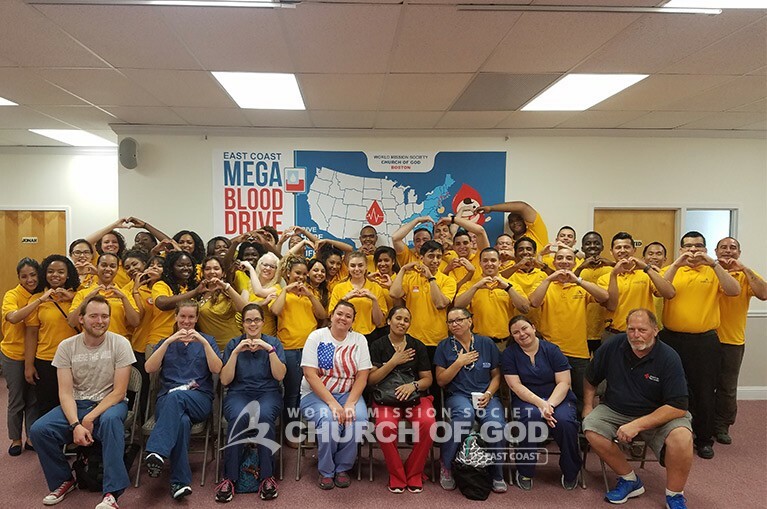 The Blood drive event are filled with so much excitement and love of God. I gave blood in high school and it was a nice experience but I didn’t fully understand it. 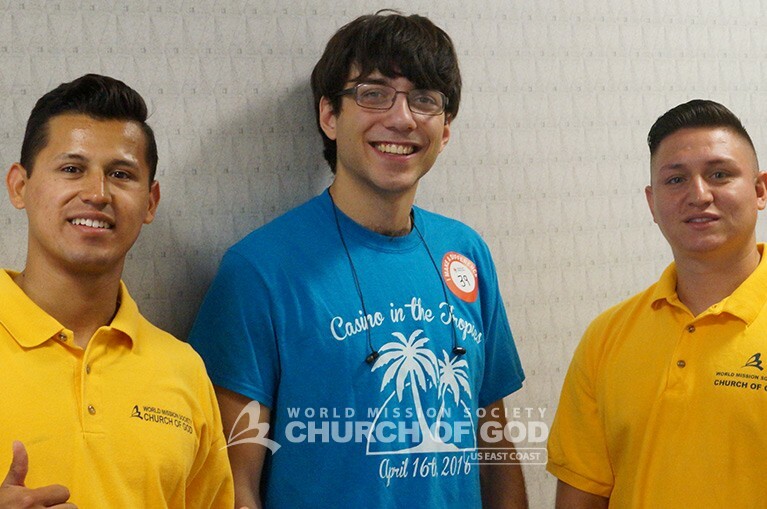 Now being a member of the World Mission Society Church of God, it means so much more to me to be able to participate in a blood drive and be able to serve others with a purpose and change lives. Amazing! Boston Church of God congratulation. I had a chance to go the NYC location to donate blood. Before I came to Church of God(C.O.G), I never donate blood because I was affaired of the needle and just seeing blood in general. But when I first attended C.O.G. I saw their years after years mega blood drives, saving the thousands of people lives. I was amaze and decided I want to be selfless and save lives as members of C O.G.During the blood drives, C.O.G members did not only help to cleaned, provided waters and contribute in saving lives, they were always smiling. Where, in the world, do you see people, 24/hours, smiling? 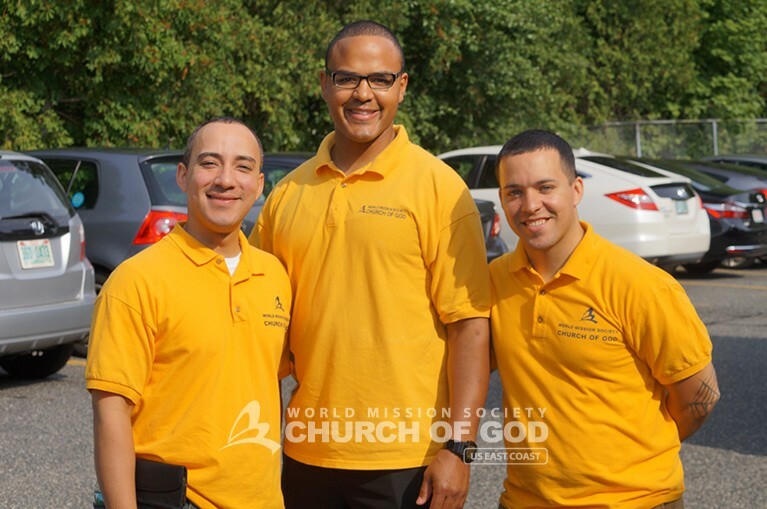 Members of C.O.G continue to carry the mission of God in saving the whole world. Thanks to Elohim God. I’m glad and happy that I am part of WMSCOG. Wow, this is amazing, the Church of God members are very involved in the community, always helping out. Through this blood drive, I can see the example of God being put into practice. It is so amazing to see Christian’s who are dedicated to giving back to the communities and to people who are need. This is truly heart warming to see the World Mission Society Church of God coming together to save lives. Actions speak louder than words! Wow!! Truly thanks to God for allowing us to host such a wonderful blood drive. 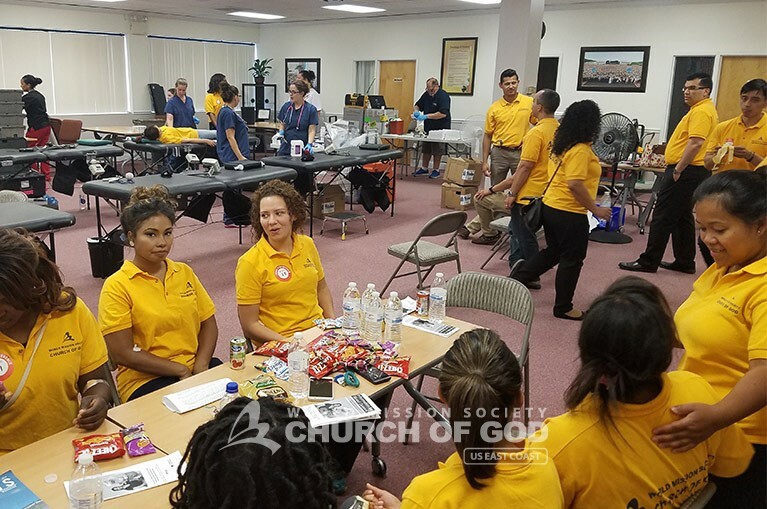 We had an amazing turnout that day were many people were able to come and donate and also learn about our church of God.I really hope we can shine more of mother’s glory through many more event like this one . This event was truly special. Even those who were afraid to give blood were put at ease by all the bright smiles in the room. My heart is warm with the thought that participating in this blood drive helped save lives and shine the of Almighty God. Wow the Church of God is always serving the community what a beautiful event this was. Members always serve with a smile and loving heart. No surprise why the Church of God received the Queen elizabeths award, the most prestiges award ever given to a Church. I love being a part of the Church of God! Truly I feel like I am part of something great. I never gave blood before, but after learning about how this church truly cares about their neighbors, I gave it a try. Honestly, this church has a heart for humanity. Amazing seeing the Church of God coming together on helping so many people and not only in their community but all along the east coast, it’s truly a blessing! Thank you for your kindness. The future looks bright through you.